Our apartment s in the village of Argentiere above the French Alpine town of Chamonix. It is a high quality modern two bedroom apartment sleeping 6 with plenty of off street parking. Located close to the centre of the village of Argentiere high up in the heart of the Chamonix Valley, France's most famous Alpine winter and summer resort. Access to the apartment is superb, just over one hours drive from Geneva International Airport and within a short walk of bus and rail services. Great views of Mont Blanc & the Argentiere Glacier come alive with the afternoon sun when the balcony makes the most of the ideal location. The apartment is located just 100 metres walk from the world famous Grands Montets Ski Station and benefits from superb views direct onto Mont Blanc, Aiguille du Midi spire and the Argentiere Glacier. It is close to all amenities for your complete comfort and convenience winter or summer! Information on Skiing in Chamonix Valley: There are few areas in the Alps that have as many opportunities for skiers & Outdoor Enthusiasts as the mountains of the Chamonix Valley. Without doubt Chamonix offers some of the wildest and most beautiful skiing to be found anywhere in the World but also a vast choice of skiing for everyone from a complete novice , a confident intermediate or an off-piste expert there are an endless supply of skiing & boarding opportunities within the Chamonix Valley. In the summer, the outdoor options are even more extensive with walking, climbing & cycling being the most popular of these especially if you take advantage of the many cable cars and funicular railway . Perhaps the greatest single area for ski lovers is the Grands Montets, directly above our apartment and the village of Argentiere. The location offers unrivalled access to an incredible choice of high mountain skiing terrain including glacier and off piste skiing. Additionally, there are five major groomed ski areas within the valley and all easily accessible by car, bus or train. as both bus and train services stop 30 metres from the apartment. This is the largest ski area in the valley and the two lifts (Cable Car Teleferique and fast 4-man chair Telesiege) which give access to it, are only 100m from the apartment. These take you to the Lognan level (2000m) from which a second cable car leaves for the summit of the Aiguille des Grands Montets at 3233m and access to incredible skiing areas including directly onto the Argentiere Glacier. There is also a fast 16 man Gondola to the Aiguille a Bochard at 2766m as well as five other chair lifts including the Hearse giving access to a huge area of skiable terrain, on and off piste! There is nowhere in the world quite like this amazing area and it is all right on our doorstep! Le Brevant, Le Tour & Vallorcine, Le Flegere. All are connected by regular bus service from the apartment and all offer enough for a weeks skiing in their own right! No other place gives access to such amazing skiing whilst offering all the facilities normally associated with a much bigger resort. The Chamonix Valley not only benefits from the most scenic of locations but possesses excellent facilities that include a swimming pool, skating rink, and a vibrant shopping area. We have carried out an extensive programme of rennovation & modernisation to make any stay in the apartment comfortable & convenient. Toilet facilities available both levels. Shower with hot water 24/7. Washing machine. Underfloor with additional electric radiators. Full size clothes washing machine. Versatile and comfortable apartment living dining kitchen area. Versatile and comprehensive with serving counter. Table with four chairs and two stools. Large community garden area and river frontage. Our apartment has just about every amenity; the kitchen has an oven, dishwasher and micro-wave. Downstairs there is a toilet and upstairs a bathroom with powerful shower and an additional toilet. There is a washing machine, TV and radio with Bluetooth. Wifi is available through Orange on a Pay -as- you- Go basis. The village has excellent facilities including : a fantastic cafe/bakery, great bars, restaurants and take away pizza, sports shops and ski hire .Don't forget to ask for your discount! An even greater range of facilities can be found in Chamonix Mont Blanc including an excellent swimming pool and ice-skating rink as well as countless shops and restaurants. Nous avons passé une très bonne semaine dans cet appartement très agréable. Très lumineux, pratique, vue superbe. We have stayed here several times & booked for this summer too. It is beautifully maintained and everything works. The kitchen is really well thought out & has everything needed to cook meals every night. Views are stunning & the locality makes it ideal for winter sports (very near Grand Montets lift), lovely in the summer with loads of low level walks & situated right in Argentiere & easy access rail/bus/car to Chamonix. A relaxing and easy holiday for our family with our older children still wanting to come. Thank you very much. We had a perfect week in Argentiere. The apartment is nice, clean, and very well equipped. We will come back. 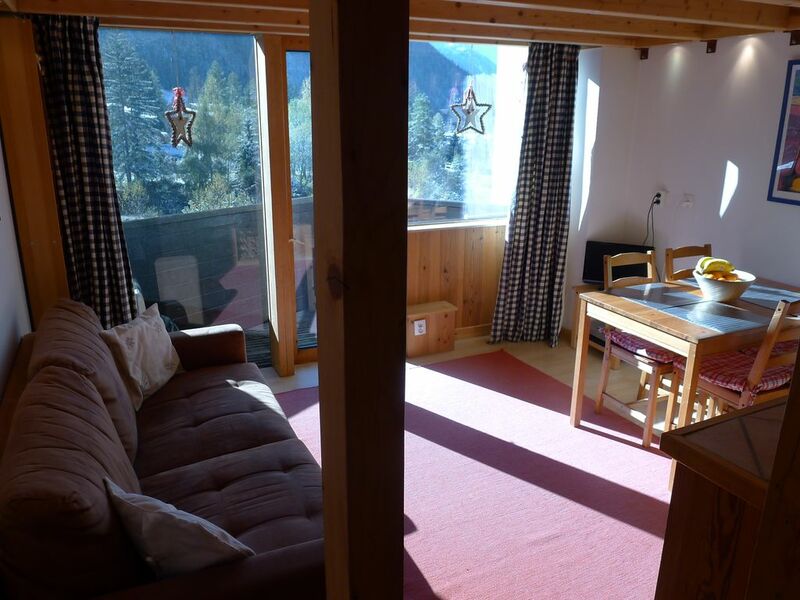 We've stayed in Argentiere many times in the Winter and Summer and this apartment is lovely. Beautiful view of the Aiguille Verte, Aiguille du Midi and Mont Blanc. Really close to the lifts and bottom of the Grand Montets resort run. Really powerful shower. Owners extremely helpful and friendly. We definitely plan to stay there again. Living room and kitchen fine and a great view. Plenty of storage space. Double bedroom generous and comfy but bunk room tiny and no heating in the bathroom so can be cold getting out of the shower but that did have great pressure. Easy access to pistes on foot or by car or bus. Handy for ski shops, restaurants and only 5 mins walk from a supermarket and bakery that's open in time for breakfast. Easy access by car to Chamonix for more shops and restaurants and by motorway from northern Europe. Owners friendly and helpful. Good spot for a week's skiing or mountain wlaking in summer. Many thanks for your time in writing a review. Sorry about heating in bathroom, all apartments have cooler bath rooms. The bunk room is ideal for children who turn the room in to their secret den. The double sofa bed in lounge is more suitable for additional adult use. Our apartment (www.MontBlancView.com) is ideally located within the village of Argentiere which is just over one hour's drive from Geneva International Airport in the Chamonix Valley. There are a variety of Airport Transfer Services to Chamonix Mont Blanc from the Airport; car rental, taxi, bus & train. There are amazing skiing choices direct from the Apartment. Beautiful Green runs at Le Tour to the fabulous off piste wonderland of the Grand Montets directly above the apartment complex. Access is excellent and the high mountain atmosphere simply breathtaking. You will not be disappointed with the skiing & snowboarding available in every direction. When the snows disappear from the lower slopes, the whole area becomes and outdoor lovers paradise with exceptional walking, climbing and cycling choices. Facilities in the village of Argentiere are excellent and a host of alternative activities within a short car, bus or train ride. Ski: There are few areas in the Alps that have as many opportunities for skiers as the mountains of the Chamonix Valley Mont Blanc. The apartment is next to the Grand Montets Ski Area: There is nowhere in the world quite like this amazing area and it is all right on our doorstep! Without doubt Chamonix offers some wildest and most beautiful skiing to be found anywhere in the World. Whether you are a complete novice , a confident intermediate or an off-piste expert there are an endless supply of skiing opportunities within the Chamonix Valley. Perhaps the greatest single area for ski lovers is the Grands Montets, directly above the village of Argentiere where the apartment is located. The location offers unrivalled access to an incredible choice of high mountain skiing terrain including glacier skiing. Weekly rates apply - Saturday to Saturday or Sunday to Sunday. Visit our on line booking site at: montblancview.com. A discount of 10% is available on bookings of two weeks or more. Clients must provide bed linen and towels or arrange their own rental from Agence Montagne (www.agence-montagne.com) It is a condition of our rental that clients clean the apartment fully before their departure. An additional fee of £100 is charged if this is not done.